We haven't really covered the purchase of WestJet dollars on Rewards Canada yet, we've been meaning to but many other posts have been or are on our list of things to write about ahead of the ability to purchase WestJet dollars to top off your account. The ability to purchase WestJet dollars came out a few months ago but wasn't really advertised by WestJet as it was released the same time as when the expanded relationship with Delta happened. Well we can't really get around not writing about purchasing WestJet dollars as they now have a bonus for buying them. When you purchase anywhere from 1,000 to 3,000 WestJet dollars you'll get an additional 15% during this promotion. The maximum you are allowed to buy per calendar year per member is 3,000 excluding the bonus. So is it worth to buy WestJet dollars with this bonus? It potentially can be when you are redeeming for the WestJet Rewards Member Exclusive flight options. 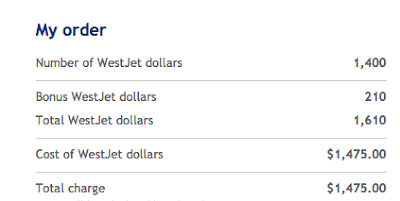 These are the fixed price awards for redeeming on WestJet and Delta Airlines. If you buy 1,400 WestJet dollars, you'll get 1,610 in total with the bonus for $1,475 plus tax. 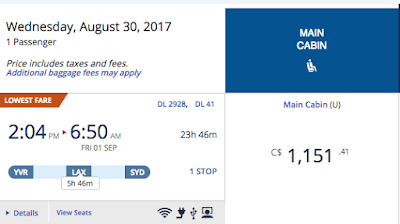 Those 1,610 dollars are enough for a round trip ticket in economy on Delta Airlines between Canada and Australia. If we look at Vancouver to Sydney at the end of this August, you'll see you can get there for 750 WestJet dollars plus $111.51 in taxes. For this trip those 750 dollars actually cost you around $720 (the 1,400 level with bonus equates to a purchase price around ~96 cents each including taxes). How much does the same flight cost on Delta? It costs C$1,151.41. 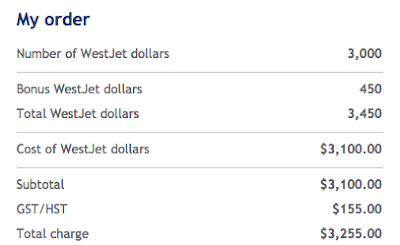 With the WestJet dollars purchase option you are spending $720 + 111.51 in flight taxes and fees for a total of $831.51. So you are actually saving $320! There you have your answer. In some cases it can make sense to purchase WestJet dollars with this bonus as it can end up helping you save money on flights that are booked under the Member Exclusive Option. In any case you can even bring the price down further if you buy the maximum amount of 3,000 WestJet dollars. At that level you are paying roughly 94 cents per dollar including taxes. Click here for complete details on this offer and/or to buy WestJet dollars. This offer runs until August 20th.